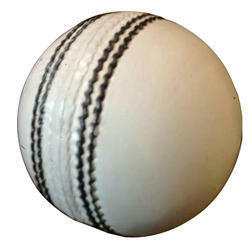 Keeping in mind the requirements of clients, we are offering an exclusive range of Leather Cricket Ball. 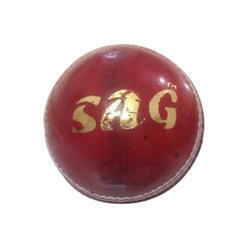 TheseLeather Cricket Ball are made using optimum grade material and are appreciated for their superior performance and high durability. These are designed to perfection keeping in mind the intricacies involved in the game. Enriched with vast industrial experience, we have been able to offer a wide range of Tournament White Leather Cricket Ball. Available with us in standard size, the given balls are made with precision by using quality approved material under the supervision of experts. It is demanded by cricketers for its optimum performance and water resistant nature. 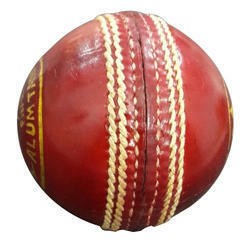 With years of experience in the domain, we offer our customers a quality assortment of Red Leather Cricket Ball. Suitable for playing professional level cricket; the given balls are precisely made by our experts by utilizing premium grade material. 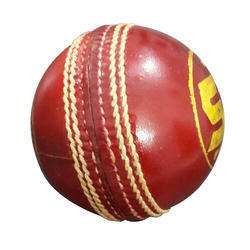 These Red Leather Cricket Ball are known for their water resistance and non-abrasive nature. We are backed by a vast domain knowledge and immense technological expertise to offer an entire gamut of Cricket Balls including Test Red Leather Cricket Ball that is made from the finest grades of raw materials such as alum tanned leather that is water proof compressed leather. The leather is pre-stretched and robustly stitched with 80 stitches of pre-waxed twisted cotton thread. It has a new composite cork core that has a controlled bounce and offers perfect hardness. Our cutting edge automation process ensures uniform pressure of 1400 lb uniformly to the compressed and stretched leather. The ball is made in accordance with ICC/ MCC rules, U-15, U-19, U22, Ranji Trophy regulations and is tested as well as approved by R & D Center, Govt. of India. 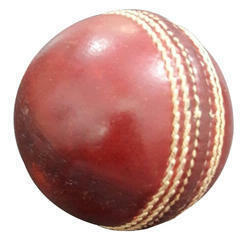 We are backed by a vast domain knowledge and immense technological expertise to offer an entire gamut of Cricket Balls including Light Weight Red Cricket Leather Ball that is made from the finest grades of raw materials such as alum tanned leather that is water proof compressed leather. The leather is pre-stretched and robustly stitched with 80 stitches of pre-waxed twisted cotton thread. It has a new composite cork core that has a controlled bounce and offers perfect hardness. Our cutting edge automation process ensures uniform pressure of 1400 lb uniformly to the compressed and stretched leather. The ball is made in accordance with ICC/ MCC rules, U-15, U-19, U22, Ranji Trophy regulations and is tested as well as approved by R & D Center, Govt. of India. Looking for Leather Balls ?